Sacher-in-Motion: over 150 years of Hotel Sacher Salzburg are a promise for the future A hotel that historic seeks for development from time to time, at least the hotels interior and exterior of the hotel, in which its history has been written. At the Sacher Hotels time never stands still for our guests and we would like to provide the highest possible comfort and conveniences of current times. Therefore from September until mid-December 2018, we will not only redesign a selection of rooms and suites on various floors, but will also enhance some corridors and the facade. We will do our utmost best to ensure that our guests enjoy their stay at the Hotel Sacher Salzburg as usual. ------------------------------- *Best location in Salzburg, directly at the river Salzach with a wonderful view from the old town. *City center within walking distance. *Privately owned by families Guertler and Winkler. *Outstanding service with extra personal touch in an exclusive ambiance with distinctive Austrian charm. *Comfort and service at the highest standard. Sacher Bar: The Sacher Bar is a great meeting point to kick off an evening with friends or business partners. Enjoy our cocktails, the live piano music, or simply a few relaxed late night hours. 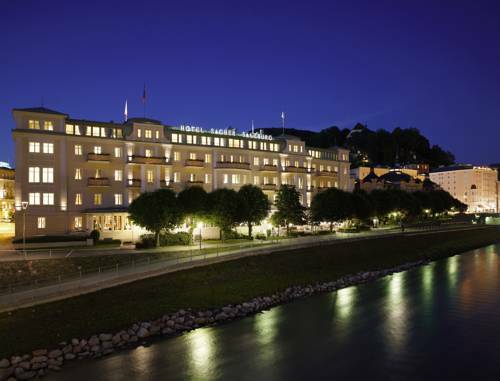 The Hotel Sacher Salzburg is located in the city center of Salzburg at the banks of the river Salzach. The famous Festival Hall is just a 10 min walk from the hotel. The historical shopping street Getreidegasse is reachable within a 5 min walk.